Being accepted to NIU’s nursing program in 1978 was a great opportunity coming from a blue collar upbringing with parents who never attended college. Leaving an urban setting to come out to DeKalb was a very new experience for me. My father encouraged me to become a nurse and I just followed his direction not knowing what I wanted to do. The faculty at NIU truly allowed me to experience this unique profession. I was immediately challenged and knew this was something I could love for life. After graduating in 1982, I returned to Chicago to work. I then returned to DeKalb to marry my husband of 30 years who owns a local business. My first thought was to return to NIU to receive a MS in nursing. Background: My experience began at Children’s Memorial Hospital in Chicago right out of college. I also worked at Shriner’s Hospital and did pediatric home care while in graduate school. Other clinical work included obstetrical nursing at Copley Memorial Hospital and work as a Public Health Nurse. I returned to the NIU School of Nursing in 1992 as a nursing instructor in maternal child health. One of my greatest achievements was the work I did with Mary Uscian and Dr. Sara Barger in writing and receiving funding for a $775,000 grant from the Dept. of Health and Human Services Division of Nursing. Through this funding the School of Nursing opened Tri-County Community Health Center, a nurse-managed clinic for underserved populations. I served as the academic coordinator and director for this clinic from 1994-1997. This clinic still exists on the Kishwaukee College campus and is owned and operated through the KishHealth System. Low income populations are still served. 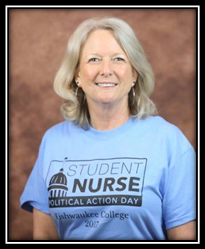 I have taught maternal child nursing, fundamentals of nursing, community health nursing and medical surgical nursing at both NIU and Kishwaukee College. For the past 15 years I have served in administrative positions. I served as the Director of Personal Health Services for the DeKalb County Health Department as the Senior Leader for all public health nursing services and for the past five years I have had the honor and pleasure of working for Kishwaukee College as the Dean of Health and Education/ Director of Nursing. Advice to current nursing students: Recognize that you are with people during a most vulnerable and often frightening time of their life. Listen to what people are saying and always think about what the “best” action should be. Remember we are the most trusted profession, live up to that expectation.